An Ashdod mall put up a Christmas tree for the first time — and it’s not sitting too well with the southern Israeli city’s ultra-Orthodox deputy mayor. “This is something intended to hurt anyone who identifies as Jewish,” Shas representative Avi Amsalem said in a post on his Facebook page. 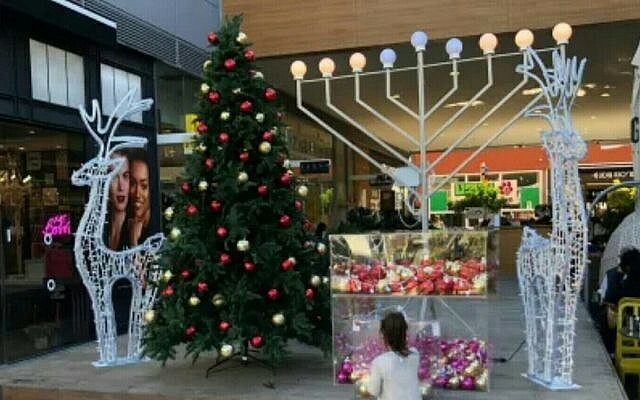 The mall had responded to previous criticism by erecting a giant menorah next to the trimmed tree on Monday, even though the Jewish festival of Hanukkah was ending. While the Christmas tree was making its debut at the mall since it opened in 2015, other malls owned by the same company have featured trees in previous years. Some 160,000 Christians live in Israel, most of them Arab, and the president and prime minister send out official greetings for Christmas. On Christmas Eve and Christmas Day, the Tourism Ministry provides a free shuttle between Jerusalem and Bethlehem, where a traditional Mass is conducted. The Jewish National Fund has sold Christmas trees for about two decades. Over 25 percent of Ashdod’s population are immigrants from the former Soviet Union, who traditionally mark “Novy God,” or New Year’s in Russian — a day celebrated beginning December 31 that encompasses Christmas-like rituals and symbols. But many of Israel’s approximately 1.6 million Russian speakers see Novy God as a cultural holiday and time for family gathering while most Israelis celebrate their new year on Rosh Hashanah, and treat both Christmas and New Year’s like any other day with shops staying open, kids going to school and adults to work.